Many holidaymakers have passed a pleasant half hour at a roadside cave, before buying a couple of souvenir bottles. Visiting the winery of a favourite cru, to taste wine in the company of the person who made it, is a rewarding experience. But increasingly, winemakers are opening their homes to paying guests, with an opportunity to taste wines over dinner at the host’s table. Today around a hundred wine properties in the Bordeaux region offer B&B, table d’hôte or gîte services to a varied clientele of grape-pickers, buyers, journalists, and tourists. We spent a week chez les vignerons in the heart of Bordeaux’s most popular tourist area, Saint-Emilion, and its neighbouring appellations. A famous tourist destination, the village of Saint-Emilion and its vineyards are classed as a world heritage site under the protection of UNESCO. The town itself, like other French centres of tourist pilgrimage, is very busy in the summer months. However, in February we were able to take in its medieval streets and ancient monuments unmolested. And even in the dark winter months, there are one or two good restaurants open catering for a mainly local clientele. 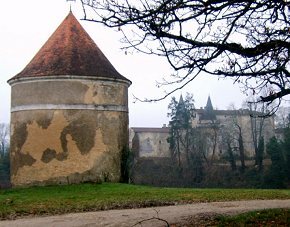 Also open all year round are the châteaux, both grand and not so grand, who welcome an eager public. Situated between Châteaux Cheval Blanc and Figeac, the vineyards of La Tour Figeac are blessed with a rich terroir. In 1994, realising this potential, German industrialist Otto M. Rettenmaier brought a completely new management philosophy to the estate and the renaissance began. In the vineyard, a biodynamic approach to viticulture has been adopted and organic products are used to treat the 14.5 hectares of vines which are planted to 60% Merlot and 40% Cabernet Franc. In the winery, new techniques including micro-oxygenation enhance traditional methods to produce a forward wine that also has the capacity to age well. We are given a tour of the winery by cellar-master Caroline Gaullier (right). A lover of classical music, Rettenmaier has named each oak vat after a famous composer and so during the assemblage, the team talk of adding a bit more Schubert or Mozart to the cuvée. The second wine, L’Esquisse de la Tour Figeac, reveals a minty freshness on the nose. Red fruits and a touch of oak supported by a supple tannin and fresh acidity make a very pleasant, pert wine. The grand vin is more concentrated, with floral aromas and a balance of black fruits and spices on the fine finish. Both will benefit from a few years ageing, but are drinking well now.During the tasting we are joined by the proprietor who gives us a tour of the guest accommodation in the main house. ‘Our guests have use of the whole house which, in spite of its classical architecture, was built fairly recently’, he tells us as we pass beneath the pale stone pediment of the main door. The four large guest suites, each with private bathroom facilities, have access to the formal reception rooms. Occasionally, Otto cooks for his guests at an impressive ‘piano’ range in the contemporary kitchen/dining room. The accommodation is very smart; you could imagine bumping into the likes of Robert Parker on the way to the dining room, a man who frequently gives excellent notices for Otto’s wines. If soil and climate influence a wine’s character then the winemaker moulds its personality. Reflecting aspects of his own personality, Otto Rettenmaier has created a classic but thoroughly modern wine. 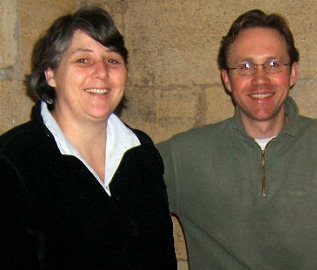 Well acquainted with wine tourism, Veronique Ballu (below, with Patrick Hilyer) runs guided tours of the cellars at Clos Fourtet where her husband Tony is director. In 1999 the Ballus purchased a hectare of grand cru vines on very deep gravels west of Saint-Emilion. Originally from Champagne, Tony is passionate about viticulture and his exacting methods in the vineyard produce an outstanding wine, rightly celebrated by the pundits including the Revue du Vin de France and Parker. High concentration and very low yields (28 hl/ha) have led Pierre de Lune to be descried as a vin de garage and although Tony is indifferent to this label it’s easy to see why. A single stainless-steel vat is housed in the winery next to which is the tiny cellar, just big enough to accommodate the twenty or so barriques that contain the two most recent vintages. A narrow flight of steps leading from the vat-room takes you to the guest accommodation – this is one property where you are literally sleeping above the wines. We begin our evening with a visit to the cellar for a tasting of the 2005 and 2006 vintages. The 2005, assembled and cleared but still in the barrel, has an alluring complexity, a delicious acidity and a solid structure. The nascent 2006 is firm and full of fruit but in spite of their extreme youth, both wines speak more of their terroir than the French oak in which they lie. For a taste of the bottle-aged wine we would have to wait for dinner.’Which year would you prefer with the magret?’ asks Veronique. We plump for the 2001 which, after a very tasty salad of Aveyron sheep’s cheese with prunes and walnuts, is just right with the magret de canard, grilled by Tony on a fire of vines. The wine has a beautiful carmine robe and unveils aromas of ripe blackcurrants and spicy oak in perfect harmony. 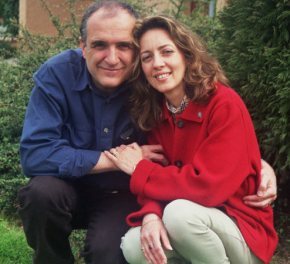 Whether or not good winemakers make equally good cooks and hosts, it is certainly true of Tony and Veronique Ballu. 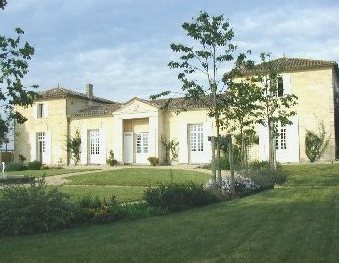 A fabulous wine property on the high limestone slopes to the west of Saint-Emilion, Franc Mayne is a true Château. The 18th century Girondine stone house is surrounded by seven hectares of grand cru classé vines under which a labyrinth of subterranean cellars house the wines maturing in new French oak. In the impressive winery, the new owners are investing in oak fermenting vats and a new reception hall and tasting room.Franc Mayne was one of the first Bordeaux wineries to offer guest accommodation, and in 2003 was awarded the World Wine Tourism award. 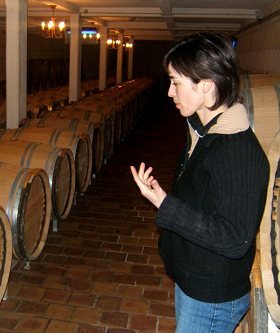 Karine Hue welcomes visitors to the Château and runs guided tours and tasting. She gives us a tour of the guest accommodation – the sumptuous, well-equipped suites, the elegant dining rooms, the masculine billiards room; the level of comfort is definitely five-star with perhaps just a touch of the Hefner mansion. Like the surroundings, the wine too is opulent. The 2002, often a lighter vintage, is full and structured. Tertiary aromas of cedar and vanilla are followed by rich, red fruit. On the palate the wine is firm, complex and long. This is a great example of how good winemaking can extract the best from an average year. Those looking for a fine wine experience at a true Saint-Emilion Château will not be disappointed here. Just a few hundred metres from Franc Mayne is Château Franc Pourret, owned and run since 1889 by the Ouzoulias family. 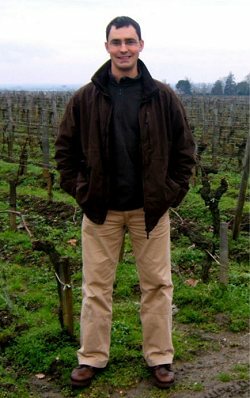 Benefiting from the same limestone plateau as his neighbour, young winemaker Francois Ouzoulias (below) produces excellent grand cru wines from 5 hectares of organic vines. An enviable terroir, restrained yields (45 hl/ha), careful organic cultivation and manual harvest and triage, all contribute to the final product. The three 2001s tasted deserve their grand cru classification. The first wine however, Château Franc Pourret, best demonstrates the fruit of Francois’ labour. The robe is carmine and the wine releases heady aromas of cassis, apple, sweet vanilla and liquorice. The palate is ripe but lively with a structured Saint-Emilion dryness balanced by the fruit. 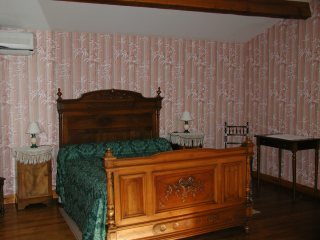 Francois’ mother Catherine has created two chambre-d’hôte rooms on the first floor of the main house. The rooms are beautifully furnished and very well equipped; each has its own en-suite bathroom. ‘Saint-Emilion is only a kilometre away,’ remarks Madame as we return to the car. ‘See, there is the church spire.’ I look at the slate-grey winter sky and imagine a summer’s evening and a walk through the vines to Saint-Emilion. He also fell in love with this 18th century Girondine house around which he cultivates seven hectares of Merlot and Cabernet vines with an average age of 45 years on clay-limestone and sandy soils. One of the few notable crus between the Libourne-Bergerac railway and the Dordogne, Bernard produces a full, generous wine. The family doesn’t live in the house but the B&B has a homely feel. The five bedrooms, named after classic Borderlais varietals, are decorated in a lived-in, bourgeois style. Bernard’s loves of photography and foreign travel combine in the pictures of the Far East that share the walls with old family portraits and memorabilia from his manufacturing career.Bernard always gives his guests a tour of the winery and a private tasting of his wines. We are given a taste of three vintages of his grand cru wine – Cuvée Préstige. Matured for up to 18 months in 30% new French oak, this cuvée develops a marked empyreumatic bouquet and ages well. The 2002 has a fresh, spicy nose and a soft but lively palate. Darker and more concentrated, the 2003 reveals ripe fruit and toasty aromas but is less lively. The 2004 has a pretty, ruby robe with young, purple tints. The oak is complemented by rich, black fruit aromas and the palate is both fresh and firm; definitely one to lay down. The B&B business is a logical extension of Bernard’s enthusiastic evangelism, and the property has been cited in guidebooks all over the world. The visitor’s book is full of praise for the generous hospitality of Bernard and his team. After breakfast we say au revoir, shake hands and Bernard hurries back into the house where another couple of eager buyers are waiting for him. Popular Bar à Vins serving accomplished cuisine with an impressive wine list. Subterranean wine-bar/bistro serving tasty, interesting dishes and fine wines. Lively, aspirational, wine-focused resto in student sector. After spending a few days in the famous vineyards of Saint-Emilion, our journey continues in the Côtes-de-Castillon. The appellation is formed by a range of small limestone hills, which begins east of the Saint-Emilion plateau rising from the right-bank of the Dordogne and is bounded by the Côtes-de-Francs to the north and Bergerac to the east. The scenery among the valleys is picturesque; a varied landscape popular with walkers and wine-lovers alike. A mild Atlantic climate and the limestone-clay slopes provide ideal growing conditions for the 3000 hectares of vines primarily Merlot with the Cabernets Franc and Sauvignon and a little Malbec. The wines are very similar in style to their neighbours in Saint-Emilion, average prices are much lower, and many are now competing in quality with the grand crus. Marie-Jo Lavau, the proprietor of this family-run wine estate in the Côtes-de-Castillon is pleased that we have found the property before the winter nightfall (there are at least two châteaux of the same name within 15km). She and her husband Christophe give us a quick tour of the guest accommodation; a comfortable annex that serves as a small self-catering apartment for up to three people, and a recently restored three-bedroom gîte that sleeps up to six. She suggests that it might be better to give us a full dégustation of the property’s wines in the morning but hands me a bottle of their top Côtes-de-Castillon wine, Cuvée Prévanche 2004, to go with our supper. The wine is the perfect accompaniment to a simple meal of rillettes, duck pâté and celery rémoulade and serves as our first taste of one of one of Bordeaux’s best kept secrets; the juicy and structured Merlot-dominated wines of the Côtes-de-Castillon. 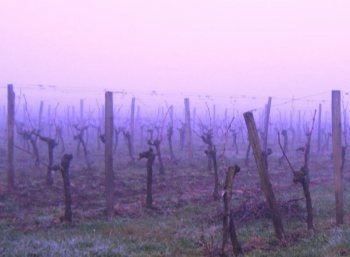 Early the following morning the bare vines are shrouded in mist. After a quick stroll in the vineyard we are treated to a horizontal tasting of four wines from the 2004 vintage. The ‘côtes’ wine Cuvée Classique, from 90% Merlot, is clean and fresh with pleasant red fruit aromas. Its oak aged counterpart, Cuvée Prévanche, coming from vines with an average age of 40 years and matured in 25% new oak releases toasted and spicy notes and reveals a sound but supple structure. The Lavaus also have a vineyard just over the parish boundary in Saint-Christophe-des-Bardes that contains 0.7 hectares of grand cru rated Saint-Emilion vines, botled as Clos d’Hortense. A clay-limestone soil coupled with a high proportion of Cabernet produce two wines (one oak-aged, one vat-aged) with a rich blackcurrant aroma and a mouth-watering acidity. The oak-aged wine is firm and juicy enough to be put away for a couple of years. The Clos d’Hortense may possess a little more finesse than the Prevanche, but the biggest difference between the two is price – in today’s market côtes wines fetch half the price of their grand cru stable-mates. British customers may be familiar with the wines of Paul Valade who sells a good proportion of his wines to the UK market. He cultivates 15 hectares of Côtes-de-Castillon vines, vinified in a thoroughly modern winery in the commune of Belvès-de-Castillon. The Valades produce two wines – Château Grande Maye, the first wine, is from 30 year old vines (75% Merlot, 20% Cabernet Franc and 5% Cabernet Sauvignon). The 2001, like many others tasted from this oft-overlooked vintage, is bursting with ripe red fruits supported by a restrained oak and firm tannins. The second wine, Château Brisson, from the same year is lighter in style and softer. 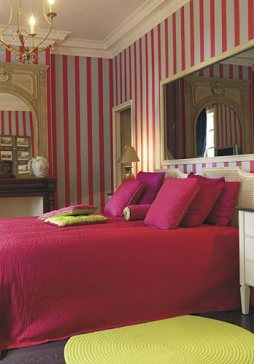 The business is a family affair and Madame Valade’s sister accommodates guests of the Château in her home near the property.Lise Gonin is an impeccable B&B host and fount of local knowledge. Breakfast includes fresh home-made specialities, great coffee and real English tea. She has three double rooms, one of which has a private bathroom, the other two having shared facilities. Evening meals aren’t served, but there are a couple of good, inexpensive restaurants in nearby Castillon-la-Bataille. Investments in the vineyard and cellar in consultation with Michel Rolland’s team and Jean-Luc Thunevin of Château de Valandraud had already been made before they took over the property. Their first vintage, the 2004, was cited in Le Guide Hachette (2007) and was recently placed fourth in a list of the best Castillon wines, including Château d’Aiguilhe and Domaine de l’A, by La Revue du Vin de France (February 2007). The wine comes from 2 hectares of vines at the western limit of the Côtes-de-Castillon, just 500 metres from the Saint-Emilon AC boundary. Only 10,000 bottles were produced in 2004 of the main label La Roche Pressac. A second wine, Cadet de la Roche, and a third, La Rochecotte are also produced. La Rochecotte 2004 expresses a delicately perfumed nose of redcurrants and spice; a wine for early drinking but lively enough to support a salad of gesiers de canard – the entrée to a perfect meal with the Lirand family. Next came the second wine Le Cadet 2004 which, after 12 months in second- and thrid-year barriques, adds a nice layer of oak with notes of liquorice and a good lively acidity to the palate. The top wine, La Roche Pressac 2004 was tasted with a hearty confit de canard, a recipe from Jean-Marc’s place of origin, Toulouse. The wine has a greater concentration of almost stewed fruits on the nose especially cassis and a deliciously toasty oak. Firm and full, with a good level of acidity and a long finish – this is a wine to put away somewhere cool and dark for a couple of years. No one should leave this property empty-handed – even the Canadian cyclist went away with a bottle of La Roche Pressac tucked into his pannier! A few minutes’ drive from the Côtes-de-Castillon and you find yourself in the appellation of Puisseguin-Saint-Emilion and the little village of Puisseguin, dominated by its feudal Château. Following a siege 1587, the castle’s military use was gradually replaced by viticulture. In the late 1950s Jean-Albert Robin purchased the property and, by selling the main castle buildings, invested in the development of the vineyards and winery.Today, Château Puisseguin Curat is still in the hands of the Robin family and is managed by brothers Jean-David and Jean-Francois. Madame Robin manages a 3-bedroom gîte in an annex of what used to be the 19th century vineyard workers’ lodgings. From the gîte, one looks out onto the castle, the tower and the clay-limestone slopes of the vineyard, planted to 70% Merlot, 25% Cabernet Franc and 5% Cabernet Sauvignon. ‘We make, mature and bottle all of our wine,’ Madame Robin tells us, ‘but much of what we produce is sold through the négotiant, the rest we sell direct to our clients.’ Madame also relies on Gîtes de France to market and manage her delightful gîte and this gives British clients the ability to book the property through an English-speaking agent. This hands-off approach to marketing allows the family to concentrate on what they do best – cultivating healthy vines and producing high quality wines. After showing us the gîte, winery and cellars, we are given a dégustation in the impressive tasting room. The Robin’s produce two wines; a full-bodied oak-aged cuvée prestige which is matured in new oak and a well-structured cuvée tradition which is assembled from wines matured in stainless steel and second- and third-year oak barrels. Travelling west from Puisseguin-Saint-Emilon takes us towards Pomerol and its powerful, creamy wines. Richness and concentration, as well as stratospheric prices, have earned the appellation world-wide fame. The gravels and clays provide a unique geology, ideally suited to the Merlot grape. Although situated in the neighbouring appellation of Lalande-de-Pomerol, Château Belles-Graves is only a few hundred metres from Pomerol’s unofficial first-growths. The property also shares a similar terroir on steep, south facing slopes above the river Barbanne. Xavier Piton, whose grandfather bought the property in 1938, produces a classy wine from 17 hectares of Merlot and Cabernet vines. His young team is led by cellar-master Silvain Garoste who greets us outside the winery and soon we are chatting about cultivation techniques and yields as we take a promenade of the vineyard. ‘We have quite a good topography here,’ says Silvain with typical Gallic understatement. We look out over the vines that cover the entire hillside down to the river 100 feet below. The property overlooks this wonderful panorama, as do the four guest bedrooms in the west wing of the main house. Officially registered as a Gîtes de France chambres-d’hotes this is a B&B with a difference. 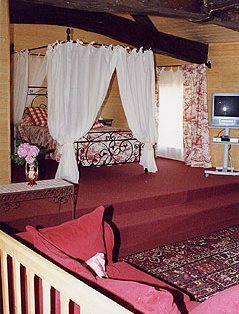 The rooms are furnished and decorated with antiques and each has its own en-suite bathroom. In the summer breakfast is served on the terrace overlooking the formal gardens and the labyrinth made entirely from young Merlot vines. The two main soil types here are clay and gravel, and both sit above a subsoil rich in iron oxide. The wines, which are full and firm in their youth, have a good balance of oak and fruit and age well. We taste a vertical flight of three vintages – 2002, 2003 and 2004. The 2002 has fresh, leafy, red fruit aromas and is soft and lively on the palate. The 2003, a year which can produce a flat wine, has a nice lively palate with riper, black fruits and empyreumatic aromas. The 2004 extols its fruit and shows great promise, although like the others is drinking well now. These are not explosively concentrated wines, but they are harmonious – an adjective that aptly describes this handsome château. Saint-Emilion’s neighbours are graced with a landscape rich in well-managed vineyards and well-made wines. The appellations are relatively young; Cotes-de-Castillion for example only achieved AC status in 1989. As such the market for these wines is still developing and many offer good value for money. This gives the canny wine-buyer an opportunity to find great wines that compete in quality but not in price with their grand cru cousins. The B&B’s and gîtes here also offer value for money, even compared to the formulaic roadside motels seen all over France, and there are few better ways of tasting and buying wine than while staying at the château. ‘Plat du jour’ workers’ dining room.